Today we are giving something back to the developer community — an open-source, on-site rich text editor. 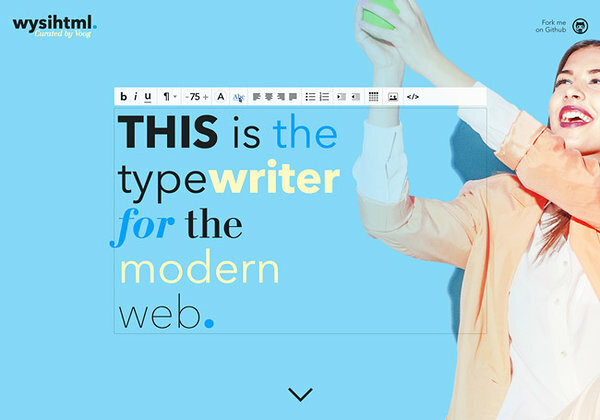 A typewriter for the modern web — Wysihtml. Unlike many other website builders, Voog lets users edit text and images right inside their site, on page. Usually you’d have to open some separate box for writing text. The problem with such approach is twofold — you won’t see the changes in action, inside the actual design and layout — and it adds a layer of spatial complexity for the users. Our approach has been pretty difficult to achieve. Our solution, Wysihtml (forked from Xing's unmaintained editor, thank you!) has to work across all modern browsers on all platforms. And it does — on Mac, Linux and Windows, Android and iOS. The amount of work we’ve put into building this tool has been massive. We’ve reworked, extended and optimized Xing's original over the last year continuously and received great contribution from the community — it already has been forked 37 times and developers are contributing to it constantly. A lot has yet to be done of course. There are many known issues that we are continuously solving. If you are developer, we’d be thrilled to get your feedback, requests and bug reports at the project’s Github page.